It’s what still attracts people here; close to the burgeoning township of Sydney yet far enough to break from city life. But from the 1830s, North Head was more than a simple respite for arriving ships. For 150 years until typhus, smallpox and scarlet fever became history, Manly Quarantine Station tended the ships’ sick, entertained the healthy, and buried the dead. After intensive restoration, the 35 hectare property, now situated in Sydney Harbour National Park, transformed into the 4.5 star Q Station Hotel. Q Station is tucked into the western curve of Sydney’s North Head peninsula, a five minute drive from Manly and 30 minutes from the city centre. It looks across the harbour to Dobroyd Head and Middle Head near Balmoral, with views of the city behind. The pace is slower here, not least because the bus shuttling visitors around the extensive property takes six minutes to get from reception at the property’s top, through the mid-level accommodation quarters, to the wharf precinct down at the beach. Walking though, means ducking into sienna and yellow-ochre painted heritage buildings, discovering high-ceilinged guest lounges and rooms. Nature and history take precedence, so there is a sheltered sandy beach rather than a pool, and a funicular stairway (234 stairs… I counted) rather than a gym. Sure, you could always take the bus to avoid the 234-stair funicular stairway between the wharf and accommodation precincts. But you'd be missing this view and those trees. Image: Sydney Coast Walks. There are 104 rooms, including nine self-contained cottages. Most are grouped together in the original accommodation quarter that people migrating to Australia would have stayed in. The five retreat cottages above the former hospital – in quarantine days, the Isolation Precinct – give a truer sense of the property’s spread. The beauty of converting a room built to house patients from the 1901 Sydney plague outbreak is that there is no need to pour “heritage” down guests’ throats like medicine. There is no chintz, no heavy Edwardian furniture, and no tired Australiana. Instead, the Deluxe Queen room is early colonial period restraint paired with contemporary fittings (flat TV, small writing desk, chocolate brown decor and crisp white linen). It also means no air-conditioning, as if that kind of thing matters: a heater and ceiling fan suffice. A Deluxe Queen harbourside room, like the one we stayed in. Image: Q Station. We share a long timber verandah with neighbouring rooms, wandering brush turkeys, and cheeky kookaburras. It’s the perfect place to watch the Manly Ferry cut its way to Circular Quay. Deluxe rooms have a generous size ensuite with combined shower/bath. The building's original fabric can be seen conserved underneath modern white tiling. Working more closely within the site’s original usage, “Heritage” rooms have an external bathroom that are private to each room. The view from Ian and Tara's shared verandah. Next stop – crack open the cheese and biscuits before heading down to the Boilerhouse at the wharf for dinner. Image: Sydney Coast Walks. Once the power hub of the original quarantine station, the refurbished Boilerhouse Restaurant now offers share-plate dining at the harbour-side base of the property. The seasonal menu aims to reflect the diversity of those who spent time here in years past, and what we’d now call – in both people and food – modern Australia. Fig carpaccio on buffalo curd with black garlic, Hiramasa kingfish pastrami with wasabi and toasted nori, pavlova with whipped coconut and wild rice. A selection of local and regional drinks (beer and cider from four Northern Beaches breweries, gin from Manly, wine from regional NSW) complement the menu, with attentive and genuine service. A buffet-style breakfast is served in Views Restaurant overlooking Sydney Harbour. There are no airport-dashing, business-travelling deadlines here over a relaxed bircher muesli, bacon and eggs with an agreeable 7am start. Breakfast is served in Views Restaurant. Image: Sydney Coast Walks. During the day a cafe opens near the wharf-side museum for visitors, serving sandwiches, pies and hot drinks. The Engine Room Bar, open weekends only, serves burgers and pizzas. While the city is just across the water, and Manly even closer, there is enough to do at Q Station or within walking distance that a short stay may feel, well, too short. Guests and visitors alike can enjoy the on-site museum, history walks and ghost tours. From almost every ship that was quarantined here, there is an inscription carved into the sandstone walls marking their stay. The museum near the wharf, autoclave building and quarantine-era shower blocks are open for the public to wander through. The autoclave building is open for all to wander through. It represented a major advance in stopping the spread of disease and lice, but for some European passengers who had survived the atrocities of WWII, seeing their luggage taken away would have been traumatic. Image: Sydney Coast Walks. 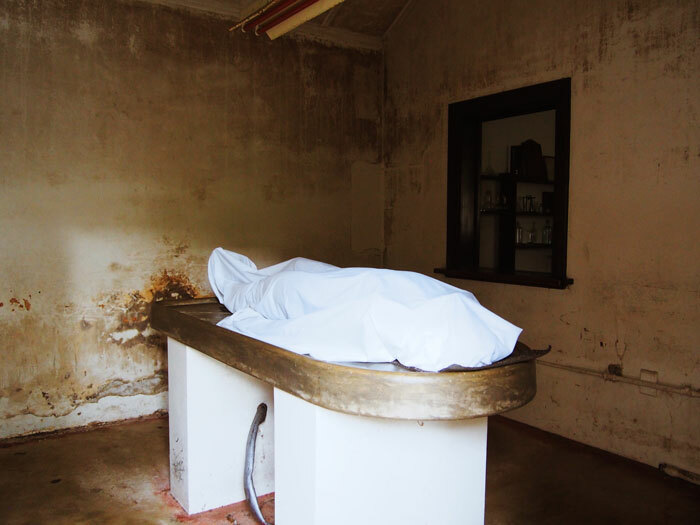 But ghostly hot-spots such as the hospital, morgue and gravedigger’s cottage can only be accessed on a Q Station ghost tour (which range from paranormal investigations, to family friendly tours, as well as scary sleepovers). The former morgue. Only on a ghost tour can you get inside the door. And only on a ghost tour can you smell the weird, can't-quite-put-my-finger-on-it smell that still resides here. Image: Sydney Coast Walks. Offering the best of both worlds, Q Station is a destination hotel with city temptations at its doorstep. Its balance of heritage with modern comfort will attract guests and day visitors who seek nature close to the city. Booking Details for Q Station, Manly. Rooms from $174. Ghost tours from $38. History tours from $18. Q Station – 1 North Head Scenic Drive, Manly. Tara Wells travelled courtesy of Q Station, Manly (April 2019). Driving north from the city to Q Station takes about 30 minutes. There is free parking on-site. There are frequent ferries from the city to nearby Manly (30 minutes across a glittering harbour). A sightseeing ferry (My Fast Ferry’s Hop On Hop Off service) visits Q Station’s ferry wharf in the middle of the day. Both services take the Opal Card. The 135 bus route stops near Q Station’s front entry, and heads to and from Manly Wharf. Feeling a million miles away from city life, yet still so close. And hearing the aliveness of the bush at night (we spotted a bandicoot!) while strolling back to the room after a fabulous meal at the Boilerhouse. Waiting for the shuttle bus around the property. Take a breath and adjust to quarantine time. Or better still, walk. Carved most noticeably into the sandstone near the wharf, are inscriptions bearing the names and dates of quarantined ships. But not until picking up Stories from the Sandstone: Quarantine Inscriptions from Australia's Immigrant Past, is it clear that there are 1600 inscriptions from English to Chinese around Manly quarantine station. This book, by archaeologists and historians Peter Hobbins, Ursula K Frederick and Anne Clarke, reveals the stories behind them. Filled with historic photos, From Quarantine to Q Station: Honouring the Past, Securing the Future (by Jennifer Cornwall and Simon McArthur) is a fascinating read of quarantine station's transformation. It follows the site's earliest known use, the first tents hastily erected by convict ships, through to the extraordinary restoration and adaptive reuse to turn the site into a hotel and visitor experience. While you may be able to find it online, the best bet is direct from Q Station's cafe / museum. Each time we're in Sydney, we stay different locations and price points to bring you the best Sydney accommodation to stay at if you're walking. We spent our honeymoon walking from Manly to Bondi, and stayed at Q Station then too. We loved it enough to want to come back! 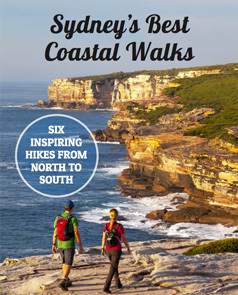 Try the ever-popular Spit to Manly walk. Just extend it around to North Head to complete the full length of the Manly Scenic Walkway. Tagged Accommodation, Books to read, History, Manly, North Head, Sydney Harbour National Park.